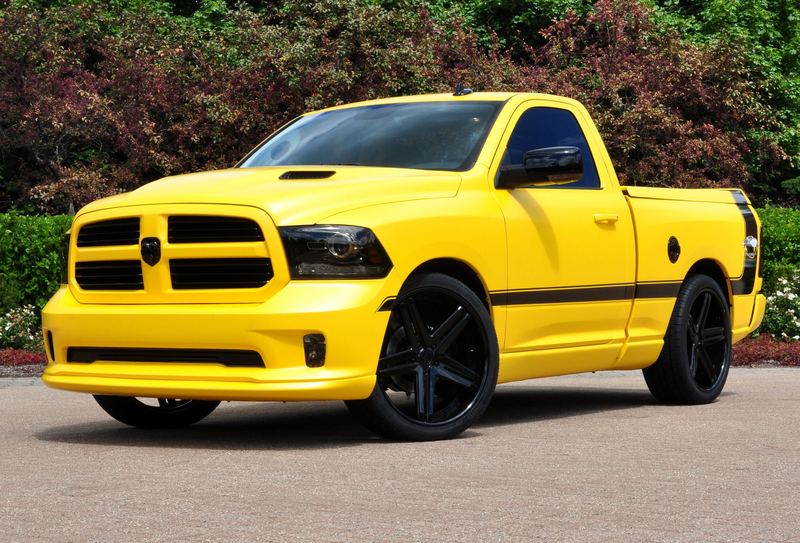 Ram is celebrating the 10-year anniversary of its Rumble Bee truck with a sting. Those in attendance at Detroit’s Woodward Dream Cruise last month got a close look at the 1500 Rumble Bee Concept, which is based on a 2013 Ram 1500 R/T. The original 2004 Rumble Bee model paid tribute to the Super Bee muscle car from the late 1960s, incorporating the bumblebee stripe and yellow and black paint scheme. That tradition continues with the 2013 Ram 1500 Rumble Bee. Powering the two-door Rumble Bee is a 5.7-liter HEMI V-8, which generates 395 horsepower and 407 lb.-ft. of torque. The engine is connected to a TorqueFlite eight-speed automatic transmission. Covered in a “Drone Yellow” matte finish with a newly-designed “Speed Bee” logo gracing both sides, the truck’s exterior is as appealing as its interior, which features leather sport mesh seats in black and yellow. The one element that stands out most of all in the cabin, however, is the eight-speed rotary gear selector knob, which lights up to display a honeycomb-patterned background. Inside the knob is a real amber-enclosed bee. Perhaps it’s a reminder for drivers to “bee” comfortable inside the truck, but not to get too comfortable. Previous Previous post: Join us for the 2013 Lehigh Valley Hunting and Fishing Extravaganza! Is this truck ever coming out for sale? Pablo, We’re still waiting to hear more, but unfortunately it looks like it’s sticking to a concept model!